The News: Fat Cyclist Jerseys Are Here! Fat Cyclist Jerseys Are Here! 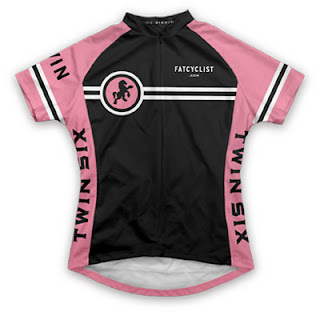 A few weeks ago I blogged about a limited edition pink jersey that the guys at Twin Six are making in honor of Fatty's wife, whose cancer is back again. Well the jersey's are in. For all of you cyclists out there, you can now pick one up from Twin Six. You can read about the jersey, and how the proceeds will be split here. You can buy the jersey from Twin Six here. They are selling a men's and women's version, as well as the original orange and black. Although, I think Twin Six is probably only donating all the proceeds from the pink version. Go Clipless wrote a nice post to those of you who think you might be too slim to wear a fat cyclist jersey. Hope to see some pink jerseys circling Central Park soon.